Neatly trimmed or clean shaven, who wouldn’t like to find a well-groomed man in their stocking? Remington doesn’t have any men in stock, but they are selling the tools to help your hubby achieve his perfect look. From beard trimmers and hair cutters to nose hair clippers and eyebrow shapers, Remington offers dozens of perfect stocking stuffers for the man in your life. 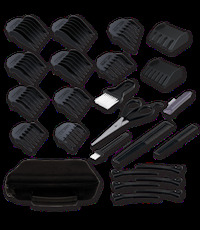 The corded/cordless Studio Style Professional Clipper makes home haircuts and facial hair trimming a breeze and all the accessories fit conveniently in a sleek, black case for easy storage. My husband has been cutting his own hair since college and was definitely impressed with the variety of tools that the set comes with – especially the texture guide and the detail trimmer. And the fact that you can use it cordless made it much easier when he cuts our boys’ hair outside in the backyard. Santa might not be able to bring you a man, but at least he can make sure the one you have is well-groomed. 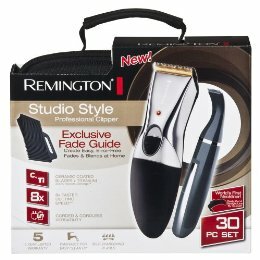 Note: Remington sent over a sample of this clipper for the review. Isn`t a professional clipper a really nice Christmas gift?